I am happy to share with you how I put this together. I'll warn you now that I am no baker and don't really know what I am doing. I read other blogs and then just kinda make stuff up as I go. I wanted to make the cake look like this cake from Real Simple Weddings. It was very helpful to have a clear vision before starting. I baked my cakes the day before using THIS recipe. I was able to fill a 12", 9" and 6" pan with each batch of cake batter. I made three batches. Each tier had three layers. I wanted the middle layer to be a little taller, so I filled that pan a little fuller each time. After they cooled I trimmed the tops, stacked them (with parchment paper in-between the layers), wrapped them in plastic and put them in the freezer. While my cakes were baking I made 3 batches of fondant using THIS recipe. I really only needed two batches, but I wanted extra incase there was a problem. Once I was done baking and making fondant I started constructing the decorations. 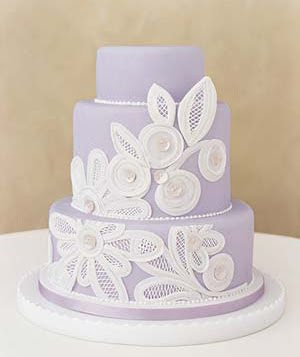 The flowers and outer edges of everything else was made of fondant mixed with TYLOSE. I found this tip from Janel at MacKenzie's Crafty Mom, mixing Tylose powder with the fondant makes it harden. I mixed 1/4-tsp with 1/4 a batch of fondant. Janel also used a pasta machine in her post. Can you imagine how thrilled I was to find a pasta machine in my basement a few weeks ago. My moth-in-law gave it to me years ago and I forgot all about it. This machine made all the difference in making my decorations. I rolled out my tylose fondant, ran it though the flat part of the machine a couple of times to make it thinner. Then I ran it through the noodle cutters to get these long strips. I used the long strips to form all my shapes. A paint brush and water worked great for glueing my pieces together. When I was done I let them dry over night. The next morning they were hard and I started piping the lattice work. I would recommend doing this the day before too, but I was too tied. I piped the lattice work with royal icing and it took a couple hours to dry. Since it was on parchment paper once the icing dried the pieces could be picked up and used as I needed. HERE is a good post about royal icing lattice work. I made mistakes, if I couldn't live with them I would break off the lattice work clean up the shaped fondant and pipe it again. For the flowers I ran another piece of tylose fondant through the pasta machine machine until it was quite thin. Then I used Wilton circle cutters to cut three sizes of circles out. I glued one on top of the other (off centered) with water. Then I laid them in various spoons and things to dry over night. While my lattice work was drying I frosted the cakes and covered them in fondant. To stack them, I used straws dowels. They were a lot easier to cut than wood. My fondant was my biggest problem. When I did my practice cake it was the easiest part, so I wasn't worried. I think I may have tried to rush myself and rolled it a little to thin. I was really embarrassed at how bad it looked. I was grateful to have big decorations to cover it up. Take your time and don't skimp on the fondant. Once everything was dry I could put it all together. I hope that made sense. Let me know if you have any questions. I'll try and answer them. I couldn't have done this without the great tutorials in blogland. Truthfully your cake looks better than your example. Great job! it is really amazing what you did! i love it! don't know if i would have enough pacience! that is amazing! hard to believe you aren't a pro. Oh my that is amazing and your pictures make it look so easy! (hopefully it is) I am going to give these a go this week as I decorate my daughters cake!! Great work. - I'm your new follower too! Beautifully done. I'm sure the wedding party LOVED the cake. What kind of cake was inside? It is awesome! It looks totally professional - would never have guessed you were making it up as you go and not doing it for years. Great job! That turned out perfect! I like yours better the the Real Simple Weddings one. I am lost for words, it is amazing! Your cake is beautiful! I feel inspired to try making a lovely cake myself! Great recreation of the magazine cake! Thanks for the tutorial. If you want to make your fondant easier to roll out, I suggest the Quik Cover mat from Sweet Wise. I have one and it's made all the difference. Completely amazing! Your lattice work is perfect! I have a hard time with straight lines. You should charge a fortune for your cakes! wow!! I had thought the flowers were out of paper - but fondant?! - great job! This really turned out like the inspiration cake! I was dying to know how you made the cross hatch in the centers! I am so excited to finally see the tutorial of how you baked this gorgeous cake! I am going to feature it on my blog tomorrow. LOVE LOVE LOVE this!!! Imagine my suprise when I came over from your feature at Sugar Bee to find out how you made it! I am so glad that my tutorial helped you out - I use Tylose ALL the time and would be completely LOST without my pasta machine!! You GO GIRL! LOVE this cake! This was super helpful and very beautiful. Thanks for being so clear and willing to share. It still scares me a bit, but I may be willing to try something so complicated! Where would I go to buy Tylose? Thanks, and blessings to you!! I have been searching for this cake for the better part of an hour! I remembered it from when it was originally posted and thought about it this afternoon... only, I couldn't remember where I'd seen it! I want to make my birthday cake, inspired by this! Love it!! Love it! You just got book marked girl! Where did you get the roller for the fondant to make the petals and stuff? how much was it? I love this design! SO CUTE!